Monday night's game against the Washington Capitals was a huge contest, for both teams really. In his pregame comments Braden Holtby even pointed out that the Isles were a potential playoff partner in the near future. Anyone who watched the game saw how much energy and passion there was, with physical play and a fanbase that once again showed up and ramped up the intensity especially as the Isles built up another 3-0 lead. Prior to their game on Saturday against the Buffalo Sabres, the Islanders announced that they had placed goalie Jaroslav Halak on injured reserve retroactive to December 20th. This meant that the Islanders had to be without him through the completion of Saturday's games. So despite getting his maintenance day in the final game before the holiday break, the Isles deemed that it made sense to give him one more game against a weaker team to get over his bumps and bruises. The Islanders were looking for another five game winning streak to head into the break with, but the Montreal Canadiens stood in their way and provided one of the biggest tests the Isles have had in weeks when it comes to understanding how they stack up with the beasts of the East. Despite a nice start, the Habs build a small lead and the Isles comeback bid ultimately fell short. This year is different in the sense that even when the odds are against them, the Islanders seem to find a way to pull out a win. We're seeing the Isles get the better of play on teams and actually end up on top, which is a reversal from some of what we've seen in previous years as well. The Detroit Red Wings have struggled since starting off the year on a hot streak, but that didn't mean they weren't dangerous. The Islanders had the task of going into the Motor City in an attempt to keep their Eastern Conference foes at bay and searching for answers. They succeeded in doing so, winning 2-1 as Detroit fell to an opponent for the fifth time in a row. After dropping their previous three games including blowing two 3-0 leads, the Islanders completed a thrilling come from behind 3-2 win against the streaking Chicago Blackhawks, restoring some of the good vibes around the team after some fans began to worry and wonder about about a team that still had plenty of room to play with. Clearly, the Ottawa Senators are one of those pesky teams with a good grasp on defense and not a whole lot going on offensively. If you're going to beat them, you have to capitalize on any of the mistakes they make. The Islanders didn't do that often but did it just enough where they eked out two wins over them, sweeping the home-and-home series between Long Island and Ottawa. We knew when the Isles brought Jaroslav Halak in to the fold in May that we could reasonably expect a step up in what we saw out of the crease in several years prior. But I don't think anyone would have expected him to show us the goaltending skills he has here in the early going, and we all walked away completely amazed at what we saw from him again on Saturday night as he single handily won the game for the Isles. Halak stopped 34 of 35 shots, including all 16 that he saw in the 3rd period to give the Isles the win and hopefully start off a new winning streak. The Washington Capitals learned from some of the mistakes they made on Wednesday night, and stopped the Islanders latest winning streak at five games on their way to a 5-2 victory on Friday night. Ok, I'm done... have a great weekend. In all seriousness boys and girls, this is perhaps the best November in the history of our New York Islanders (not including Novembers in which we were still buzzing from a shiny new Cup banner). 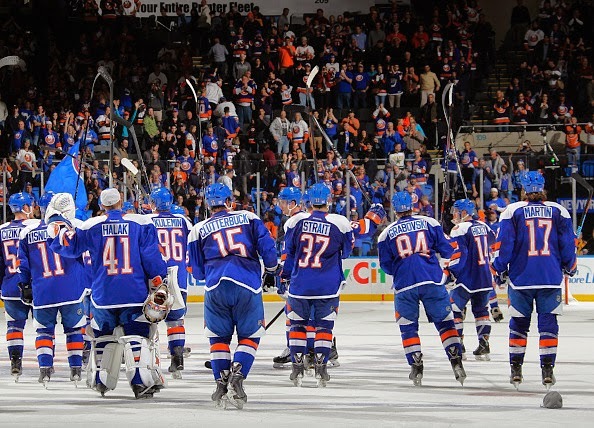 As it stands right now, the New York Islanders are 10-2 in the month of November. Let me say that one more time so that you can absorb this: The ISLANDERS, are 10-2 in the month of November. It is amazing to me that so much can change over the course of a year. So that combines for 23-36-9, 55 points, over the last five Novembers. We have over a third of those points, and nearly half the wins in this November alone. Take a second and really think about that. We are talking about the last five Novembers combined. Make no mistake about it, the page has turned, and this is a dawn of a new day for our Islanders. The Islanders have four players who are scoring nearly a point per game: Tavares 21 points, Nelson 20 points, Okposo 19 points, Strome 17 points (and is a +10), each in 22 games. Oh and by the way, the average age of these four players is 23 and a half, can you say longevity? It also seems like after many years of fillers, we finally have a legitimate starting goaltender. Jaroslav Halak has hit his stride, going undefeated in his last seven starts. So far this season, his record is 11-4-0, and his 2.21 GAA and .923 SV%, top his career numbers (2.37 GAA, .918 SV%, respectively). We finally have a defensive core with a real top four. Hamonic and Lubo seem to be back and healthy (knock on wood), and the additions have Nick Leddy and Johnny Boychuk have propelled this team to a new level. Today, we should all be thankful for Garth Snow, and the additions he made this offseason. Of course, we just mentioned Leddy and Boychuk. Leddy is the puckmover this team has lacked for many years, and as a 23 year old RFA to be, you can bank on him being a New York Islander for a long time. Johnny Boychuk is showing the Boston Bruins why NOT putting him on the Power Play was a mistake. He can stand you up at the blueline, win board battles, and makes a good first pass out of the zone to start rushes the other way. While he is a UFA in the summer of 2015 and is likely to test the Free Agent market, he has gone on record saying that he is willing to discuss an extension to stay with the Islanders moving forward. He believes the team will be strong moving forward, likes the idea of playing in Brooklyn, and to say he has chemistry with Nick Leddy would be an understatement. Former Toronto Maple Leaf teammates Mikhail Grabovski and Nikolay Kulemin seemed to be picking up where they left off, for the most part, in Toronto. Grabovski has opened up the ice surface for his teammates, giving them excellent opportunities (Brock Nelson agrees). When he has had the puck on his stick, he's finished the job (4 goals, 5 assists, +5 in 19 games). By the way, he has not committed one penalty yet this season, which is huge for the Isles, considering how rough their penalty kill was last season, and even through the beginning of this season. Nikolay Kulemin has hit his stride playing on the first line with John Tavares and Kyle Okposo. He has 4 goals and 11 assists, and most of those goals have come in the last few weeks. His physical play, defensive play, and speed have been something that the Islanders had been lacking with Michael Grabner, whether he was on the ice or not. 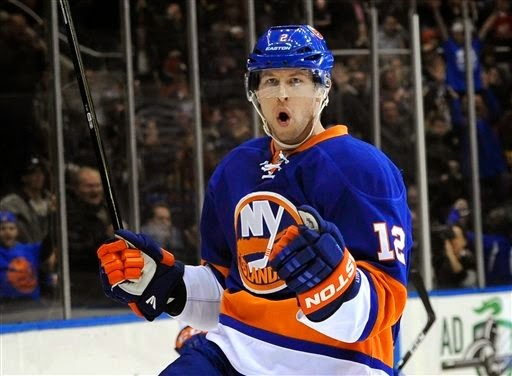 Josh Bailey, welcome back! 7 points in 14 games. We are happy to see you shooting that puck again. It's a shame that Bailey was injured when he was, as it probably hurt his momentum. What was amazing though in all of that, was how well the Islanders played, despite having him out of the lineup. In fact, it is extraordinarily encouraging. What this tells you is that this team will find ways to win in the face of adversity. It is not the only adversity we have faced this season, and due to the physical grind of an 82 game campaign, it is likely not the last. Late October saw a three game losing streak, which most people, and admittedly myself, were left saying, "Here we go again". 11 games later and we are 10 wins and 20 points richer. There is probably no better fourth line in hockey right now than the line of Casey Cizikas, Matt Martin and Cal Clutterbuck. They are putting points on the board, even on the Power Play. They are forcing opponents to make mistakes, throwing the bodies around, and wearing teams out. This is good news, especially for Martin. 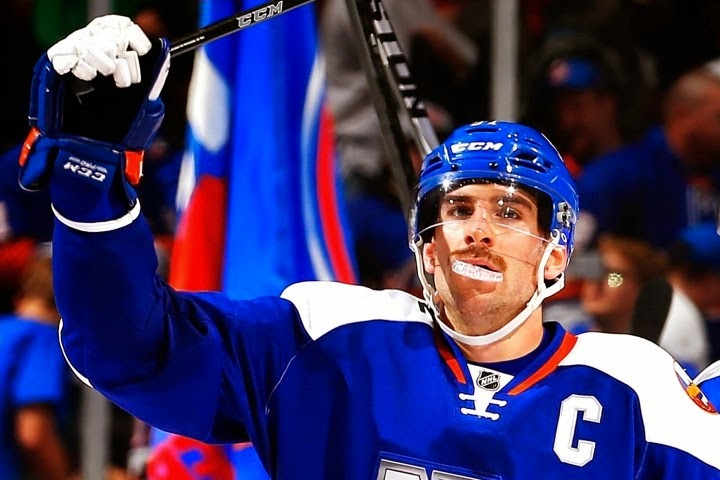 He was in the doghouse of far too many Islanders fans who had forgotten why they had loved him so many years ago. Similarly to Bailey, welcome back Matt. Let's not forget about the third member of the "kid" line, Anders Lee. The young forward faced his own adversity, when he was unable to make the team out of the pre-season. He went back to Bridgeport disappointed, but determined, and it wasn't long before the talented winger found his way back to the Old Barn. He scored his first goal of the year in late October against the Stars, and has found the net four more times since then. He also has one assist. With a full season ahead of him, there's no reason to believe why he will not get it going, picking up where he left off last season. He's feeling it, and you can tell. Frans Nielsen, what else can you say about a guy who had a career year last year? How about the fact that he too, seems like he is picking up where he left off. Is he on pace to put up the points he did last season? As of now, not quite, but that is still not a bad thing. His 12 points in 22 games are par for the course with him, but where he is contributing most of all is in the shootouts. He and Kyle Okposo have almost single-handedly gotten this team a much needed 10 points in shootouts alone. Every point will count this year. The Islanders are tied for first place in the Metropolitan Division, along with the Pittsburgh Penguins (who at this point also have a game in hand). We are still early in a season that's already been full of statements for the Isles, but no statement has been as big as what they just accomplished on Friday and Saturday night against one of their biggest rivals in the Metropolitan Division - perhaps even their biggest rivals. The Islanders found a way to stop their losing skid, but who would have thought it would come when playing two beasts of the West in the Anaheim Ducks and the Los Angeles Kings? In fact, it was perhaps the best effort on both sides of the puck that we've seen from the team this season. The Islanders improved play against the San Jose Sharks gave hope that they'd be able to score a 3rd period goal and get back on track, but ultimately it was a Logan Couture re-direct that would prove to be all the Sharks needed to give the Isles their 3rd loss in a row as they continued to shuffle lines and search for answers. With their 5-0 loss to the Colorado Avalanche on Thursday night, the Isles situation has become a bit of a concern with four games still remaining on a very tough road trip. Obviously it's still early and a season is not made or broken at this point, however when you consider what's happened in past years as this team has gone into the beginning of November it makes the situation a bit precarious. The Islanders really like those track meets, don't they? On Saturday night it was another high scoring affair, and for the second consecutive season an evenly matched Dallas Stars team came into the building and gave up a hat trick to an Islanders center. The Islanders started off playing well, keeping things simple and steady while getting save after save from Jaroslav Halak against a Penguins team that seemed a bit apprehensive. Infamously, we do not know why one of our star players is out, but all we know for sure is that he is hurt. Going back to the days of Scott Gordon, the Islanders have been very hush-hush in regards to injuries. They never really tell us what is going on, leaving us to wonder what the injury is, the severity of said injury, and the timetable for a players return. To anyone who watched the game against San Jose on Thursday night, the early indication would have been that Mikhail Grabovski had suffered a concussion. He took a hit high, fell to the ice and in the process smacked his head again, and then lied there motionless for what felt like an eternity. I was sitting in section 208, roughly 20 rows up from the injury, and to say it was gruesome would be an understatement. To be honest, it was frightening. Grabovski won't travel to Pittsburgh with #Isles. Out indefinitely is all I've heard. 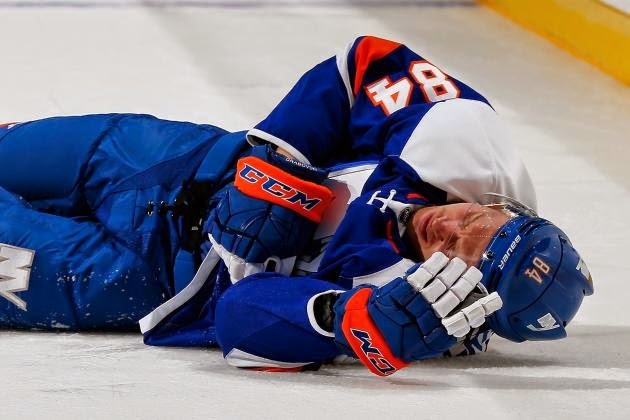 I'm going to go out on a limb here and make my own prediction for what is ailing Mikhail Grabovski, who had three points in his first three full games with the Islanders: Bruised Sternum, out 2-4 weeks. This will prove to be a tough loss for the Islanders, who have been to their best start in 12 years. Missing Michael Grabner has proven to be a blow to our penalty kill. Losing Mikhail Grabovski, who has produced early on and has provided depth as scoring, will only make things more difficult for a team who is trying to silence their critics, and who also calls upon Colin McDonald and Eric Boulton off the bench, as it seems that Anders Lee will not be called up just yet. Let's just hope that Josh Bailey's production so far can sustain, at least for as long as Grabno is out of the lineup. NYI FYI will be live today at 12 PM EST on NYIFYI.com. The Islanders were nowhere near the best team on the ice on Tuesday night when they played the New York Rangers at MSG, but they were the better team in the only period where that mattered. It helped of course that the Islanders got great goaltending out of Jaroslav Halak that kept them in the game, allowing them to tie late in the second and score four in the 3rd to give the Isles the 6-3 victory. The Islanders opened the home schedule of their final season at the Nassau Coliseum in the only possible way you could have scripted it, with a 4-3 win over the Carolina Hurricanes in an atmosphere that certainly had a playoff vibe. After making two huge trades last weekend, the level of anticipation for the 2014-15 season reached heights that no one can remember in recent years to the point where every passing day seemed like it was taking more than 24 hours. On Friday, we finally had our first look at the new look Islanders and they made a nice statement in their 5-3 win over the Carolina Hurricanes. 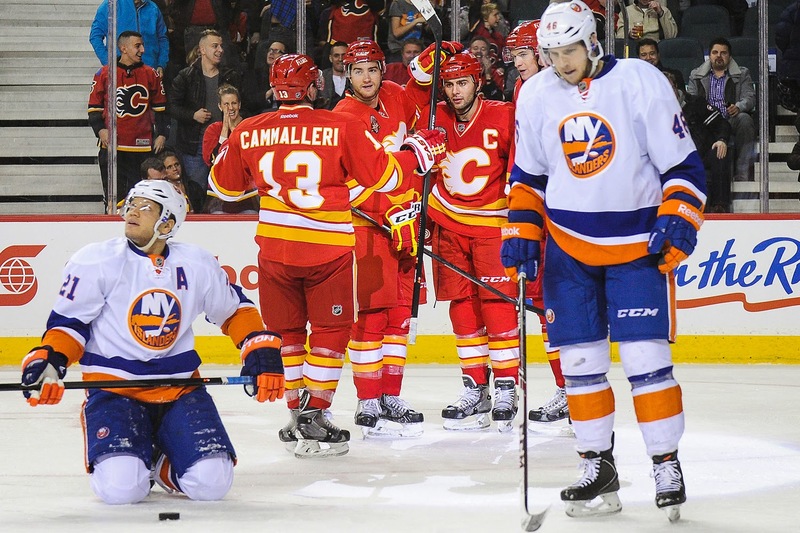 The second game for the Isles at the Barclays Center in Brooklyn went much better than the first one. However, this was not hard to accomplish given that last preseason the Isles lost 3-0 to the New Jersey Devils and didn't give their fans much to get excited about. Friday night was a little different as the Isles came out flying and put the first two goals on the board on the way to their 3-2 shootout win over their rivals from New Jersey. The Islanders dropped their only preseason game at Nassau Coliseum on Wednesday night, losing 4-2 to the Carolina Hurricanes thanks to some strong special teams play by their division rivals. The Isles kicked off their preseason schedule with a sweep of the Ottawa Senators, defeating them 3-2 in a split squad double header on Monday. Although the first day of free agency didn't go the way as many had planned, by the end of day two the Islanders entire body of work looked much better and made many who were gloomy at least smile a bit as the Isles showed some life. It's that time of year again, where hockey fans all across the country pray that their teams are the ones landing the top names out on the open marking to better position themselves to make the playoffs - or in some rare cases, maybe even become a contender for The Cup. The Islanders got off to their start rather early, trading for the rights to free agent goalie Jaroslav Halak in early May and signing him a few weeks later to a 4-year, $18 million deal.